Marathon running is as much mental as it is physical, if not more (so I’m told!). To help prepare for my first marathon I’m reading as many running books I can get my hands on. Often times I find inspirational quotes, insight and motivation in them – which I’m hoping will help train me mentally for the undertaking of a marathon. 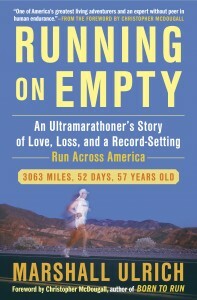 I recently finish Marshall Ulrich’s “Running on Empty – An Ultramarathoner’s Story of Love, Loss, and a Record-Setting Run Across America.” He accomplished this amazing feet of running 3,063 miles in 52 days at the age of 57 years old. He started running in San Francisco, CA and covered an average of 60+ miles/day to reach New York, NY. Now if he can run two marathons and a 10k per day for 52 days, I think I can train my body to run 1 marathon in 1 day! This is a trend I’m finding in many of the books I read. Over and over again runners say that you create your own limits, and if you release them you can accomplish more than you thought possible…how great is that?! Isn’t that the truth, though? I’m thrilled to have followed Ulrich’s journey, and if you want to check out his run across America – check out this video! My favorite part? Watching the countryside change as he moves from CA to NY. Beautiful! Wow, very inspiring! This reminds me of a saying I heard from when we lived in Africa. How do you eat an elephant? One bite at a time. Kate, I am confident that your breaking through limits when it comes to running and setting goals will serve you well throughout all of your life, not just in running. What an amazing accomplishment. The resolve in his commitment is remarkable as well. Thanks for sharing! I’m so glad you enjoyed the post. Ulrich has really inspired me! Wow, so cool and you’re amazing for sharing this book and amaaazing for sharing your passion for life and running! XOXO!!! Thanks, Kristin! This book was such a great read. I’m so glad my running zeal and passion transfers over into the bloggersphere! XO!